Russian Tea also known as Friendship Tea or Orange Spice Tea, is most commonly made by adding instant tea to the recipe. 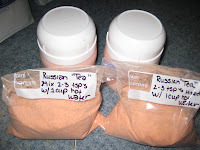 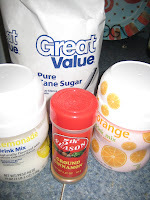 If you are like me and do not drink caffeine or want an option for your family for a warm drink other than Hot Chocolate and are trying to avoid caffeine this recipe is for you. I also like to give it as a gift to a sick friend or co-worker. It is soothing and also without the caffeine will help them relax and rest. 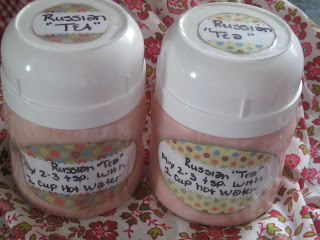 This recipe will make enough Russian "Tea" to give one to a friend and to keep one for yourself! 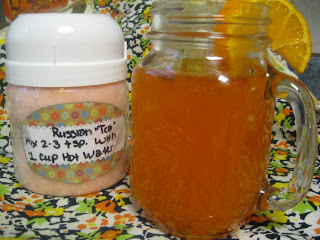 Mix 2-3 teaspoons Russian "Tea" with one cup hot water.